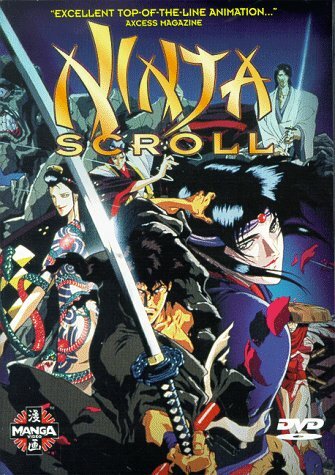 Offering Ninja Scroll DVD Ninja Scroll Series Ninja Scroll Video Ninja Scroll Music Ninja Scroll T Shirt and more with easy online ordering. Episode 5 "Diamond Child" Meet Tatsunosuke, a young thief with a special gift and nothing to lose. Matched against Tsubute, which thief will come out with the Dragon Stone in his pocket? Faced with the opportunity to join the Kimon, will Tatsunosuke take the chance, and pay for it with his life? Episode 6 "Shelter From the Rain" Apart from the others, Jubei finds himself poisoned in battle with Nenmu, a ninja who can use the bodies of people. Caught in a rainstorm, with the help of a woman and her young son, Jubei slowly recuperates from the poison. But with Nenmu�s ability to manipulate anybody, who can tell a friend from the enemy? Will Jubei�s newfound allies turn against him? Episode 7 "Blossom" Azami is back, and after the half of Dragon Stone she could not get the first time, determined not to lose it to the Kimon clan. Meanwhile, Jubei learns the truth about the Dragon Stone and the treasure of the Lost Dynasty, and he�s slowly figuring out just how precarious of a position they are all in. Episode 8 "The Fate of Rengoku" Rengoku has her mission � to get the other half of the Dragon Stone from Jubei. This is also her chance to avenge the death of her beloved brother, but at what cost? With revenge on her mind, what will Rengoku sacrifice for the ability to kill Jubei?